If we're going to start anywhere when it comes to a gaming/health connection, we need to look no further than the popular '80s video game, Pac-Man (interestingly, a game based -- for the most part -- on the concept of food). Could it be that playing Minecraft (or whatever video game floats your boat) is the key to obtaining more defined biceps or a tighter tush? A CNN article a few years back suggested that gamers' focused, goal-striving nature gives them a buff-body edge over their non video game-playing counterparts. The two young men featured in the story give credence to the theory, having gone on to become co-founders of Fitocracy.com, a website that cleverly marries fitness and gaming. The site states that you can earn "points for every workout logged" as well as obtain badges "for unlocking special achievements." Neat as that is, I think that if we're going to start anywhere when it comes to a gaming/health connection, we need to look no further than the popular '80s video game, Pac-Man (interestingly, a game based -- for the most part -- on the concept of food). All I really need to know I learned from Pac-Man? Pac-Man: He's always on the move. In his case, it's all about running... from ghosts, the enemies, or towards the much-coveted fruit. Lesson: Make like Pac-Man and run from the scary stuff too. Refined carbs. Nitrates. Added sugars. Rude folks. Heck, maybe ghosts, if that's an issue for you. Keep active. Move towards the options that score you points on the good health scale. 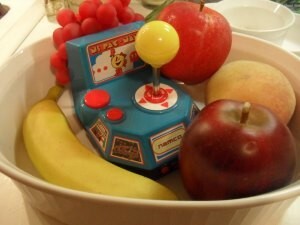 Pac Man: His "life" is extended with every cherry, apple or banana he chomps. He eagerly anticipates their arrival, at which point he rushes towards them before they disappear from the screen. Lesson: Extend your life. Like Pac-Man, go out of your way to nosh on the antioxidant benefits of cherries. Peel a potassium-rich banana. Rush towards them before they disappear from the shelves! Lesson: All that running. Geesh. Thank goodness for moments -- even if they are small ones -- to rest. Rest your mind. Rest in between sets at the gym. Get it in as often as possible; a well-rested person reaps tons of overall health benefits including warding off colds, avoiding weight gain, and maintaining good vision. With the right amount (no, getting by on four measly hours of sleep nightly doesn't count), you'll be ready to face any new challenges ahead. Pac-Man: Four power pellets on every screen allow him to go from "Pac-Man" to "Pac-Man, Sir." Consumption of the pellets amp up his abilities. It's after his consumption of them that the evil ghosts change direction and the chasee becomes the chaser. Take that, Pokey and Bashful! Lesson: Give your body and mind a boost with your own power pellets (vitamins and supplements) and help reverse the direction of the things that have been running you down: a bad mood, fading memory, high blood pressure, exhaustion. Bashful or Pokey? Not anymore! Pac-Man: Sometimes ghosts get him. He takes a wrong turn. He downright loses. Yet, he has other lives to live out -- chances, if you will. Each time, he can start fresh, chose to move in a new direction and make the most out of life. Lesson: Don't get bogged down in nonsense about ghosts from the past. After all, your wellness counts on it. Ate way too much for a day, week or month? Start fresh and get back on track. Regret a life decision? Forgive yourself and others and keep moving. Learn from mistakes. Forge on. So there you have it. Everything you ever wanted to know about better physical and mental health, you learned from Pac-Man. This article originally appeared on Jennifer's site, FlabbyRoad.com, in 2011. This version contains some edits.